Welcome to Cherfire Collies in the beautiful Okanagan Valley in British Columbia, Canada. Here at Cherfire, we strive for excellence. We believe every collie should be sound, well balanced in mind and body, as well as typey and beautiful. Therefore, we are dedicated to improving the collie breed by conscientiously bettering genetic health, and continuing to improve and preserve the beauty of the breed. We also believe that a dog should be healthy for a lifetime and therefore we offer lifetime written genetic guarantees. We create healthy bodies and stable temperaments so that ability and willingness are combined. We include buy-back clauses in our contracts, so that every Cherfire collie can always come home if necessary. We are proud that we have been part of the foundation of 4 associated service dog programs! We have a number of rough and smooth collies that live with their partners as assistance dogs, and have donated a number of puppies over the years to these worthy organizations. We also support collie rescue programs, and actively assist when possible. Our style of collie is a combination of tightly linebred Lick Creek, Tartanside, and Hi Vu, based on health, soundness, substance and great beauty! Our dogs have competed and won in many different aspects of the dog world and we strive for Register of Merits [ROM(X)] and Champion Producer awards (ChP) on all of our breeding stock. 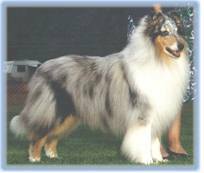 We offer stud service in both varieties, specializing in tricolor and blue merle. Many of our collies are retired after a litter or two, so we often have trained adults for placement. Puppies in the family are generally available in both coat factors. We have finished over 200 champions for our own breeding program as well as many champions for our clientele. We also offer occasional all-breed professional handling in Canada and the US, conformation handling classes and individual training. Please browse our web site and get to know our proud collie family. If you have any questions or comments, please feel free to send us a message – we would love to hear from you!